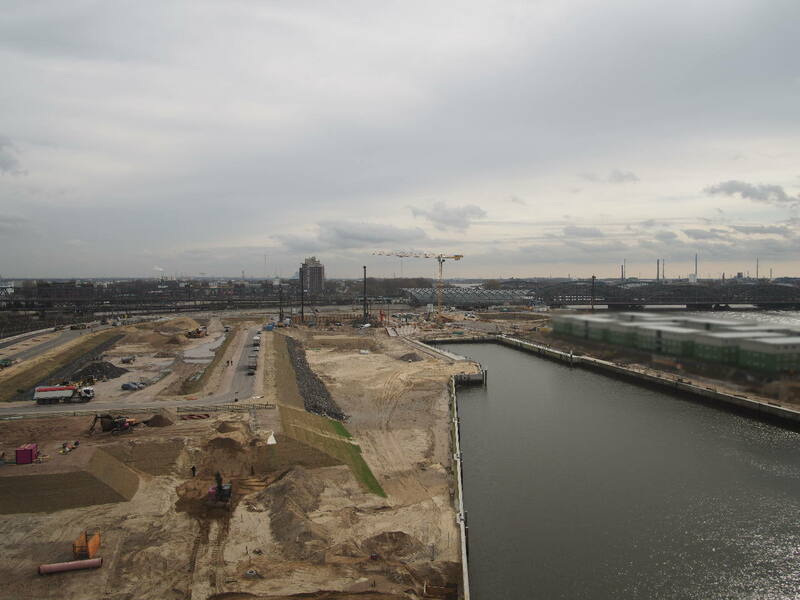 A new sustainable ‘urban village’ is developing around Baakenhafen, right in the city center. A green, socially diverse residential and recreational quarter is being created on both sides of the harbor basin in HafenCity, with various subsidized residential units for families, students, and seniors, and which will involve different social partners in the living concept’s development, plus create many jobs. The topographical center of the quarter is Baakenpark, a 1.6 hectare artificial peninsula in the harbor basin, which serves many functions. As a local park, the plot serves as a recreational area and an aesthetically pleasing recreational zone that also connects the north and south parts of the quarter. In terms of transport, the plot is very well-connected — new road and bridge connections are still in development. Alongside road construction, the U4 is being extended from the HafenCity Universität station to the Elbbrücken station. The first groundbreaking ceremony for a construction project took place here in early summer 2015, with the construction of a family hotel. The JUFA company project, just like the 150 publicly and privately subsidized apartments on the neighboring property, has been completed in spring 2018, so that the first residents to the quarter has moved in at the same time as the first hotel guests. From mid- to late 2018, this were followed by the completion of a 15-story campus tower next door with plots for start-ups, entrepreneurs, and HafenCity University, as well as a residential building by the water. On the southern part of the quarter around central Lola-Rogge-Platz, an ‘urban village center,’ which will offer residents of eastern HafenCity an attractive marketplace with local stores and leisure, sport and cultural amenities, is in development. Directly beside, a training and family center with a four-stream elementary school and daycare center for 200 children will be under construction until summer 2020. Various different socially oriented residential buildings will benefit from this excellent infrastructure, which will stand out due to numerous joint building ventures, family- and senior-appropriate residential units, and subsidized residences. While construction work has begun already for property 89, the excavators will roll in for work on at least six other projects from 2018 onwards. Three other properties with about 300 residential units in total, as well as office and commercial spaces offering over 400 jobs, were awarded in fall 2017. The architecture of the six ‘Wasserhäuser’ on the waterfront, which have already been allocated, are also emblematic of the ambitious overall spirit of this quarter. A modern take on waterfront construction, the slender residential towers will fit in organically with the maritime architectural language of Baakenhafen. Each of the three building pairs will be connected to the land with two bridges; one on the level of the promenade, and one at the level of the dock. The Wasserhäuser could be completed as early as 2020/21.